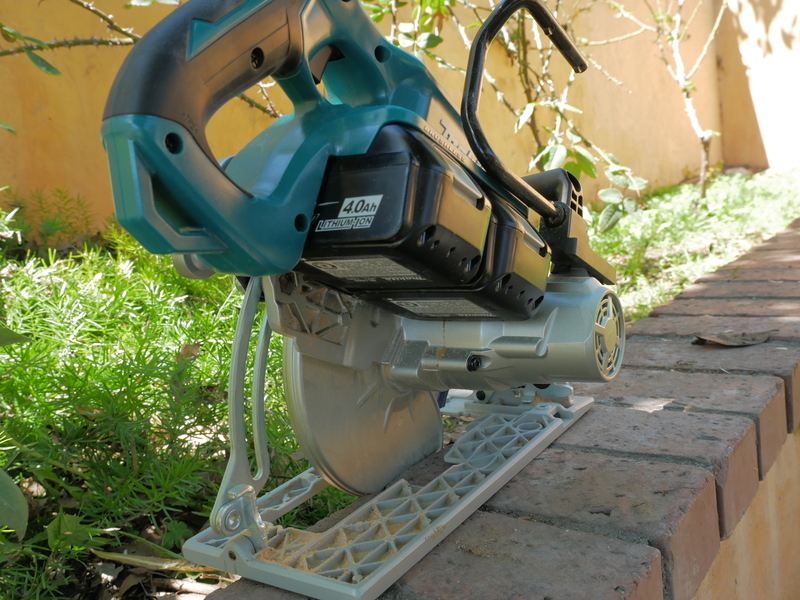 In this review we will take a look at the Makita 18V X2 36V Rear Handle 7-1/4 Inch Circular Saw. It has two similar model numbers that correspond to XSR01Z as a baretool or ZSR01PT as a kit with two 5.0 ah 18V batteries and dual charger. Makita was kind enough to provide the X2 Rear Handle 7-1/4 Inch Circular Saw XSR01Z ZSR01PT at no cost for review. However as with all my reviews, I am not paid, sponsored, or obligated to give a positive review. This review is my opinion of the product based on my usage and knowledge and my review will reflect what I like and dislike about the product. I will do my best to provide you with an unbiased review. Before we get into the performance section of this review, lets first take a look at the Makita XSR01Z 18V X2 36V Rear Handle 7-1/4 Inch Circular Saw’s features and specifications list as well as my opinion on them. Prior to this saw, there are a few cordless circular saws that offered the power to run regular size 7-1/4 inch blades and had performance that came close to or was simlar to corded sidewinder circular saws. One of those was the original Makita X2 circular saw which uses two 18V batteries together (as all Makita X2 power tools do) to achieve real 36 volt performance. 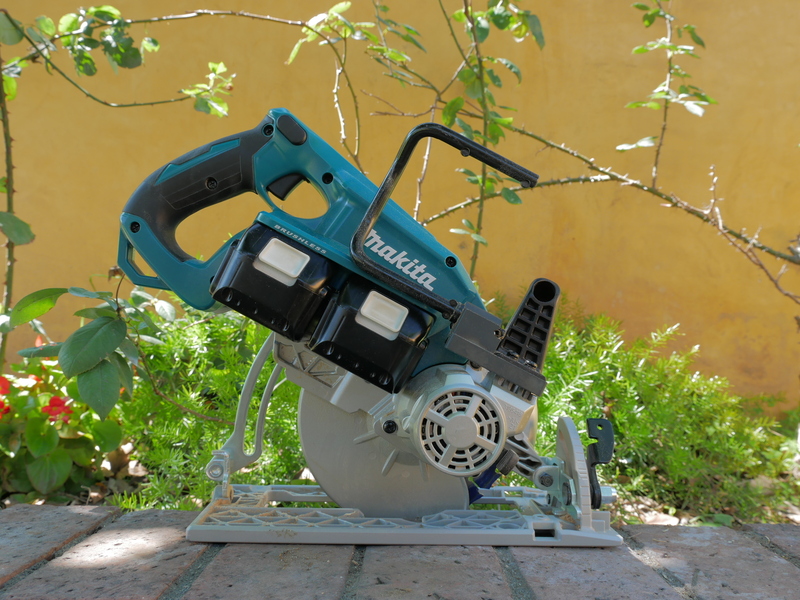 While very powerful, the original Makita X2 circular saw used a brushed motor leading users to look elsewhere if they wanted a brushless motor cordless circular saw such as Milwaukee’s M18 Fuel models. 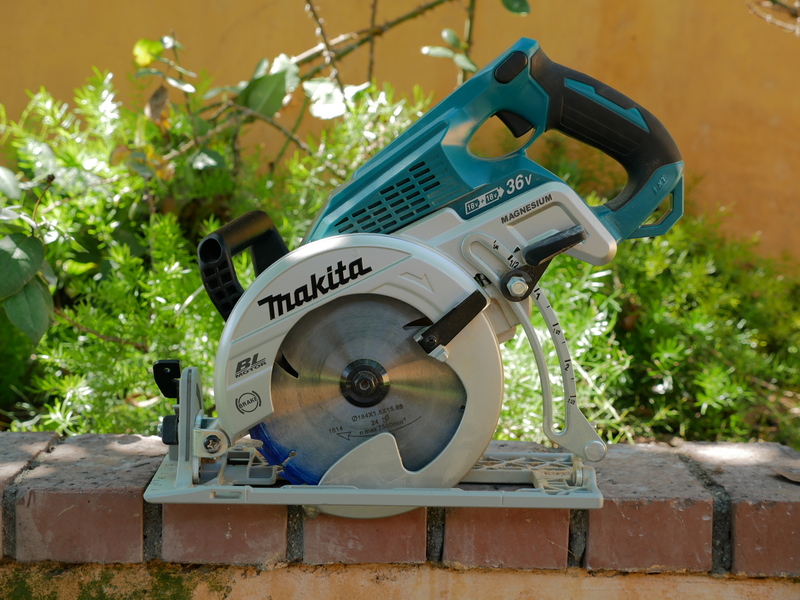 Makita did eventually make a brushless cordless circular saw but their first model was using a smaller 6-1/2 inch blade. Luckily for all of us, Makita finally released a new brushless circular saw that uses a regular size 7-1/4″ blade with their latest X2 model in this article. Being an X2 tool, it uses two 18V batteries together to achieve true 36 volt performance. What’s interesting about this new model is that they call it a rear handle circular saw. Notice how this new circular saw looks like a worm drive saw however it is not a worm drive because it does not contain a worm drive gearbox and instead is actually a sidewinder. Looking at the right side of the saw behind the blade, we see a standard sidewinder saw configuration with the motor mounted directly behind the blade with slightly offset gearing just like you would find with a regular sidewinder. It maintains a worm drive body with an extended handle that pushes far behind the rear of the saw to give it it’s “REAR HANDLE” name. The “worm drive” look is no doubt to give the impression that this performs similar to a corded worm drive saw however we’ll see exactly how it performs in the performance section further below to see if it’s performance matches it’s looks. Having “worm drive” looks it includes a large oversized front handle for gripping with your left hand and also doubles as a carry handle. This large handle design will make worm drive saw users more at home when they pick this rear handle saw. Also like worm drive saws, this rear handle saw also has the blade on the left side. Worm drive users are used to this configuration so will be very familiar to them as a result. I personally prefer the blade being on the left side as this allows a clear line of sight of the cut line for right handed users. A large rafter hook is also included on this saw and is built in. It is located on the right side attached to the motor. It wraps around the saw when not in use and can be rotated outward for use. You need to rotate the hook out of the way when installing batteries because it’s in the way but is so simple to move out of the way that I did not see this as an inconvenience. Makita being a “PRO” brand incorporated lots of pro level features such as a magnesium base and blade guard along with an aluminum blade cover and motor housing. The base is nice and beefy and the front has a ruler scale with indented markers to indicate inches which is a nice improvement over the first X2 circular saw that had a sticker to indicate a ruler guide. However Makita painted numbers instead of stamping the magnesium base. Paint can be scratched off so I would have preferred if they stamped the numbers into the magnesium base. The bevel scale however does have numbers and markings stamped into it to display bevel angles. I also like that they included a separate knob to select one of three different bevel stops for angles 45, 22.5, and 53 degrees. This saw is also equipped with an electric brake that stops the blade to a halt after the trigger is depressed. There’s also a tether notch just below the rear handle. I found the depth of cut adjustment to be easy to use since it’s on the blade side and not behind it and it is depth of cut markings are accurate with the blade. 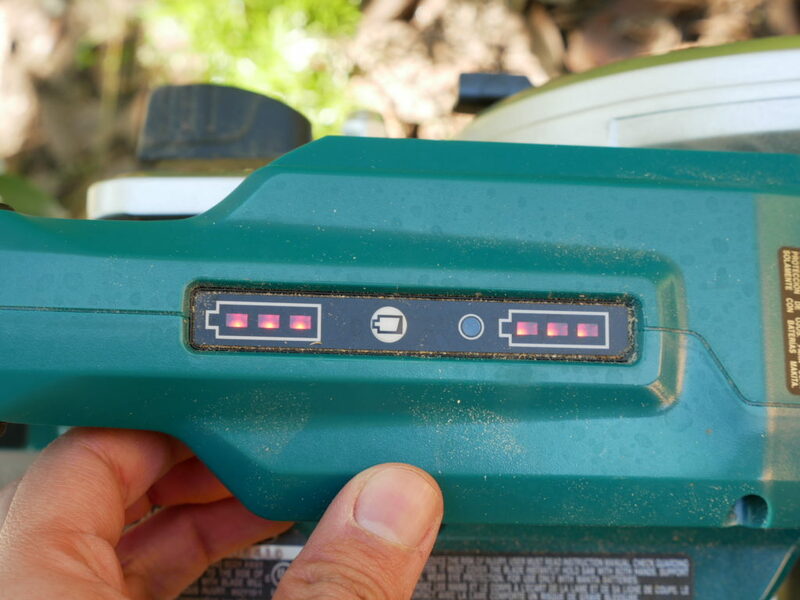 For the longest time, Makita was stubborn to update their batteries with built in fuel gauges and even though all their new batteries now include fuel gauges built in, this tool has a built in double fuel gauge to check remaining battery charge for each battery which is good for those still running old packs without fuel gauges. Since this tool uses two 18V batteries together to operate, and yes they must both be installed to run, it would become a hassle to have to charge two batteries separately. 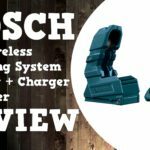 It would be but if you buy this tool as a kit it comes with a dual charger that charges both batteries at a time so you wont have to hassle with charging them separately. The dual charger is just as fast as all other Makita chargers and it charges both 5.0 ah batteries in 45 minutes which is pretty fast. As with most of Makita’s brushless cordless tools, this saw is equipped with 2 speeds one for high speed for energy savings and high torque for more power however the saw determines what speed setting depending on the cut. It will start cuts in high speed mode for optimal battery life and kicks into high torque mode when it needs more “oomph” to finish the cut. This all happens automatically in the background, all you have to worry about is pressing the trigger and following through with the cut. If you are interested in knowing which setting the saw is in, there is an LED light indicator that turns on only when the saw is in high torque mode. Makita includes a wrench to change the blade however I would have preferred them to include a hex key and a slot built into the saw to store a hex key. As it is, the included wrench cannot be stored on the saw which means that it will likely be lost. Actually I lost mine as a result of no onboard storage and now I have to refer to my hex key set to change out blades. Also not included with the saw is a rip fence. Personally I don’t find this to be a big deal as I usually use my table saw for ripping sheet goods but those of you that utilize rip fences on circular saws will no doubt miss this item. A bit of bad news for those that want to use a rip fence on this saw is that the base is missing the screw in knob to hold down a rip fence. These can be found for cheap at your local hardware store although it will require an extra trip to the store. Pricing for this Makita X2 rear handle circular saw is $199 as a baretool and $349 as a kit with two 5.0 ah 18V batteries and dual charger. Compared to it’s competition I find it to be a better value as it not only offers the lowest price but offers the most in terms of battery capacity. At the time of launch for the original Makita X2 brushed motor circular saw, it’s biggest competition was the Milwaukee M18 Fuel 7-1/4″ circular saw which is still around today and goes for $229 as a baretool and $329 as a kit with one 5.0 ah 18V battery. Milwaukee’s offering is more expensive by $30 as a baretool and even though $20 cheaper as a kit, it comes with only one 5.0 ah battery at that price. Milwaukee does offer a kit with two 5.0 ah batteries however that is priced higher at $429 making it $80 more than Makita’s kit which comes with two batteries. I want to mention that the Milwaukee M18 Fuel isn’t an exact apples to apples comparison as it has a traditional sidewinder design while the Makita rear handle saw is designed to imitate a worm drive model. There is another rear handle circular saw on the market also designed to imitate a worm drive saw and it’s from Dewalt with their Flexvolt 60V “worm drive” style circular saw. This saw is in the same category as Makita’s rear handle saw however running at 60V max instead of 36V. The Dewalt Flexvolt worm drive style circular saw is priced at $249 as a baretool and priced at $369 for the single 6.0ah battery kit or $399 for the single 9.0 ah battery kit. Either way you look at it, Makita’s rear handle saw is priced lower than the Dewalt Flexvolt worm drive style saw in either baretool or as a kit. Things get a little complicated with batteries as you get two batteries with the Makita and one single seemingly larger battery with the Dewalt Flexvolt however they rate their amp hour capacity on the Flexvolt batteries based on 20V. Since Flexvolt batteries are dual voltage batteries they can be looked at having 6 ah in 20V or 2 ah in 60V. The 9.0 Flexvolt battery is 9 ah at 20V or 3 ah for 60V. Since the Dewalt worm drive style saw’s batteries are running at 60V while on that tool, this means you are only getting 2 ah or 3 ah depending on which Flexvolt battery is used. At 2 ah or 3 ah it seems that Makita is the clear winner here in terms of battery capacity however things get even more complicated as we are comparing different amp hour ratings at different voltages. The only way to compare them directly is by looking at their total watt hour capacity. Watt hours are the universal way to compare batteries of different voltages. The formula to get watt hours is very simple, you simply multiply voltage by amp hours and you get watt hours (v x ah = wh). The combined total watt hours of two 5.0 ah 18v Makita batteries is 180 wh. A Dewalt Flexvolt 6.0 battery is 108 wh and a Flexvolt 9.0 battery is 162 wh. This is based on them being 18 or 54 volt batteries because they are actually running at 18 volts or 54 volts depending on whether they are used on a 20V tool or 60V tool. This is not a debate, these are facts. In either case we can see that Makita’s rear handle kit actually has more watt hours compared to Dewalt’s kit’s with batteries however Makita wins with a lower price point however not by very much. I also want to mention that Dewalt’s worm drive style saw is runner at a higher voltage than Makita’s saw so it might be more powerful in theory which might justify the slightly higher price point. However I have not tested the Dewalt Flexvolt worm drive style saw so I cannot say if it is more powerful or not. In the end of the day, Makita’s competion may be higher priced but the difference is so slight that the the pricing between all is similar that I would say they are in the same ballpark. Lets get one fact out of the way – worm drive saws offer more torque and cutting power than sidewinders. We already know that this Makita rear handle saw is not a worm drive saw as it doesn’t have a worm drive gearbox but it’s shape and design looks like a worm drive saw. However after testing out this saw I can easily say it is more powerful than any previous cordless circular saw that I’ve personally tested. Every test I threw at it, it passed with flying colors and cut faster due to having more torque in its motor. Ripping and cross cutting 2x lumber had noticeably better torque which resulted in faster cuts than other cordless saws I’ve tried before it. Ripping and cross cutting 2x lumber was better with this saw however the difference was little on smaller cuts BUT this saw is a beast when I tried a different test. I stacked 4 pieces of OSB and there was a huge difference in cutting speed. I compared this rear handle saw versus the original brushed motor Makita X2 circular saw (XSH01Z using 2x 5.0 ah) and versus the Milwaukee M18 Fuel 7-1/4″ model (2731-20 using 9.0 ah). These two saws were the best of the best between their voltage classes when they came out and as such are still excellent models today and there is a big difference between the rear handle Makita versus these other two. The difference in cutting speed of the rear handle saw was almost twice as fast as the other two. That’s where this saw’s strengths are which is in more demanding cuts. One negative I found with the saw was that it doesn’t have a side dust ejection port on the upper blade guard like the previous X2 circular saw and what this means is that when making cuts all the saw dust is thrown directly behind the saw and results in your shoe getting all covered in sawdust. When I did the full runtime testing, I noticed there was a pile of sawdust on my left shoe and because I was wearing shorts, lots of it got inside my shoe. I don’t understand why they removed the side dust chute on this model. I included a clip of it in the above performance clips video so you can see what I’m talking about. The good news is that this saw has a dust blower to keep the line of site in front of you clear from airborn debris. I purposely didn’t comment on it’s weight in the specs section at the top (although it is listed in the bullet list) because I wanted to talk about it here in the handling section of the review. Mimicking the design of a worm drive saw, this is a large saw and with it’s larger size comes added weight. This saw is by no means light at 12.4 lbs with batteries which is about the weight of a lightweight worm drive saw. But at the end of the day this is a cordless tool and one of the biggest benefits of cordless tools are lighter weight however that just isn’t the case here because it’s the same weight as a corded magnesium worm drive (Skilsaw SPT77WM-22). 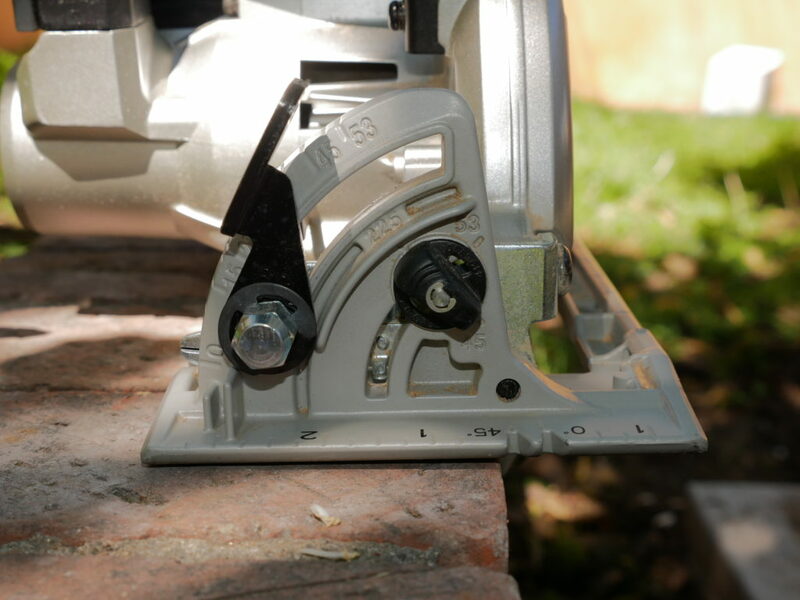 So if you are used to a corded worm drive saw, this should be very familiar to you however those not used to picking up worm drive saws will find this saw to be heavier especially when compared to other cordless circular saw models. The heavy weight in addition to the long rear handle means it’s not as easy to carry this saw with a single arm as I would with a regular sidewinder because it’s too front heavy. Those that are used to worm drives are used to this however as my personal taste, I prefer the ease of use and handling of a sidewinder. 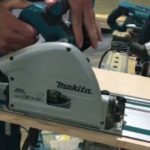 As with my other cordless circular saw reviews I also tested the Makita rear handle circular saw to see how many cuts it could make per charge. To keep testing equal across the board I made cuts into 2×4’s and used the same brand blade as before which is an Avanti Pro 24 tooth carbide tipped framing blade. Not the best blade by any means but since I’ve tested out all the other’s with this blade, you can compare the runtime figures directly. 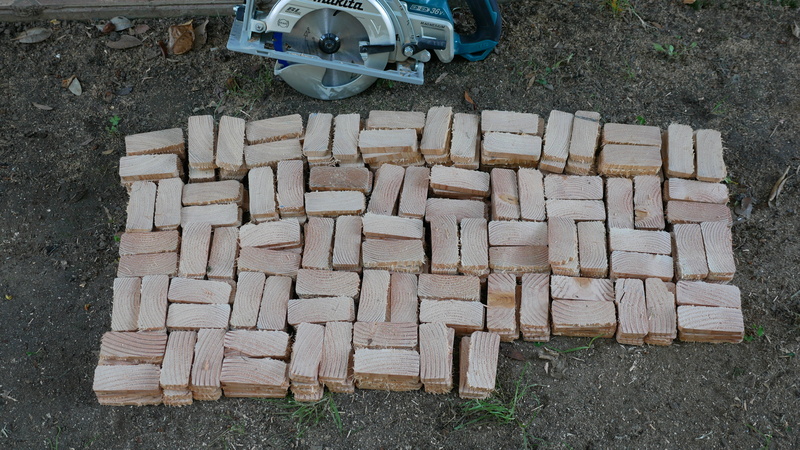 Using the included two 5.0 ah batteries this saw managed a total of 458 cuts into 2×4’s. It’s not exactly the claimed 558 cuts that Makita advertises but in all fairness I’ve never reached manufacturers claims before with other cordless saws (from any brand). It could be they used better blades such as their own Makita branded blades or possibly a Diablo blade which are my personal favorite because they improve the performance of cordless saws. In comparison I got a total of 345 cuts when I tested the original Makita X2 circular saw model XSH01Z using the same brand blade. It’s nice to see I was able to get a little over a 100 more cuts than the previous model and I believe the brushless motor of the rear handle model plus two 5.0’s instead of 4.0’s helped it achieve more cuts per charge. I already thought the original brushed motor X2 circular saw had great runtime so in my opinion the new Makita X2 rear handle gets excellent runtime numbers in my opinion. I also want to mention that you could get even better runtime numbers if you were to use a couple of 6.0 ah batteries however the saw as a kit only comes with a couple of 5.0’s meaning you will have to buy the larger capacity batteries separately. My verdict is that this is a very powerful cordless circular saw, I would even go as far as say it’s a powerhouse at cutting. I haven’t tried the latest cordless circular saws from the Dewalt Flexvolt line but out of the others I’ve tried, this is easily the strongest and fastest at cutting. I also wasn’t sure if I should put this in the cons bullet list above but this isn’t a worm drive saw. 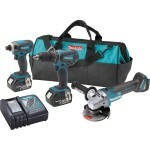 Makita doesn’t say it is but it’s design and form factor gives the impression that it is which could mislead users. The fact that it isn’t a worm drive saw and is actually a sidewinder doesn’t bother me at all. Being the first cordless circular saw styled after a worm drive, I still believe it’s heavy for a cordless model as it’s the same exact weight as a Skilsaw magnesium worm drive model and that’s a corded model. At the end of the day, this saw is an impressive beast but for my everyday use I would still prefer a strong sidewinder such as Makita’s original X2 brushed motor circular saw. That saw in my opinion has the power of corded saws and is easy to carry one handed. Where this rear handle saw shines is at making demanding cuts such as my 4 OSB sheets stacked together test. If I was in an environment where I need to make demanding cuts most of the day, this rear handle saw would be my go to saw. For everything else I’ll stick to my original Makita X2 brushed circular model XSH01Z as it’s still very powerful. But at the end of the day, my opinion on it’s worm drive form factor and weight are based on my personal tastes. My only real nit picks I believe others will agree on have to do with it not a side dust chute which means you’ll get loads of dust on your shoe and this saw not having any onboard storage for the included blade change tool. Nice review. Informative, and well laid out. Thanks for that.